Here’s a delicious and easy recipe for Cookies and Cream Cheesecake Bars. 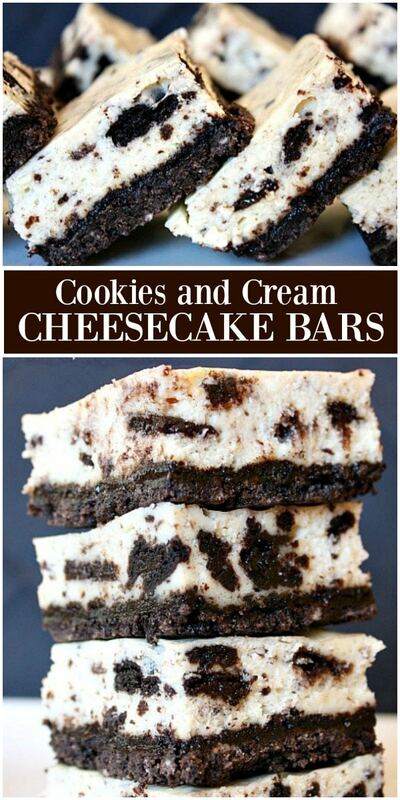 These bars have an Oreo cookie crust topped with creamy Oreo cheesecake. Watch the video showing you how to make this recipe, then scroll to the bottom of this post and print out the recipe so you can make these at home. 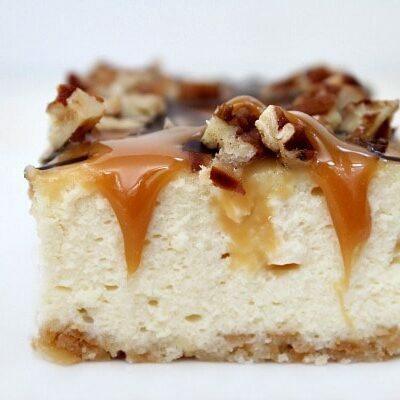 I’m quite the cheesecake fanatic, and I don’t believe there is a dessert much more delicious than cheesecake. 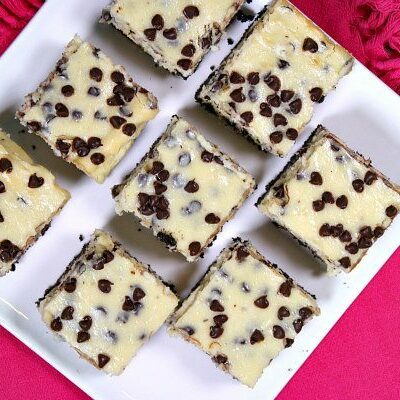 These Cookies and Cream Cheesecake Bars are one of my favorite grab-n-go cheesecake recipes. They are super easy to make, and everyone loves a dessert that has Oreo cookies in it! 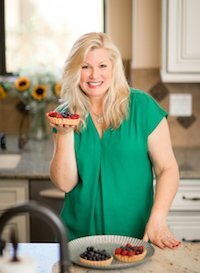 My friend Beth Lipton created this recipe many years back, and published it in her book: You Made That Dessert? Create Fabulous Treats, Even if You Can Barely Boil Water. 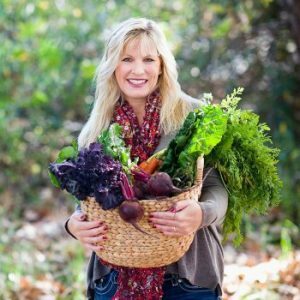 I shared the recipe way back then, and now I’m bringing to the forefront again to share with you. 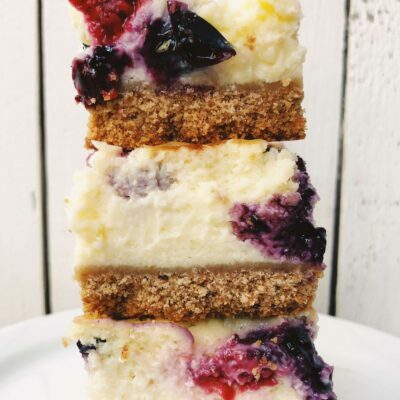 I have a lot of sweet treat recipes on my blog, but these cheesecake bars have always stuck in my mind as one of the best. Cheesecake is always a favorite, but cheesecake bars are easier to serve and you can pick them up and eat them with your hands! 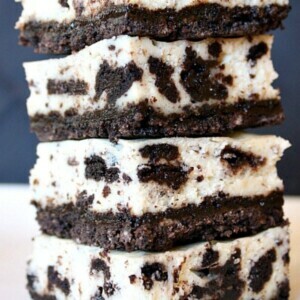 I supposed we might as well call these Oreo Cheesecake Bars. That buttery Oreo crust becomes a bit crispy after baking. And the cheesecake layer is packed with Oreo chunks too. 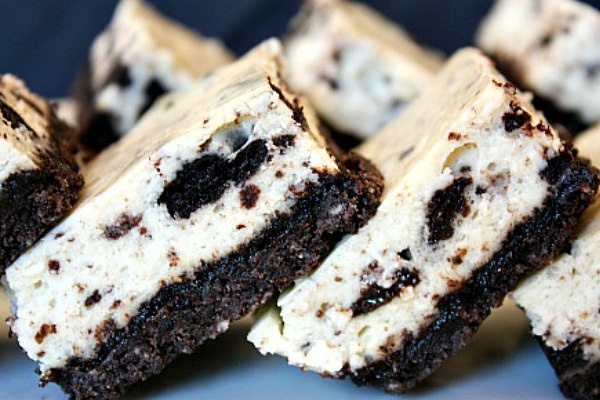 If you’re an Oreo-lover, these cheesecake bars are definitely for you. These Cookies and Cream Cheesecake Bars are a good bar to serve at a party, and they’re always welcome at a potluck too. Do Cookies and Cream Cheesecake Bars need to be refrigerated? Yes, these bars should be refrigerated until you’re ready to eat them or serve them. I like to cut them into pieces and store them in a covered container. Alternately, you can just keep plastic wrap over them. Keep these bars refrigerated and covered well, and they should stay good for a few days. Do you only use the chocolate cookie part of the Oreos and get rid of the creme filling? No. Use the whole Oreo cookie. You can put the whole Oreo (creme filling and all) into your food processor. I adore these cookies and cream cheesecake bars from cookbook author Beth Lipton. They're quite addicting. Preheat oven to 325°F. Line a 9 x 13-inch pan with foil, leaving a 2-inch overhang on two sides (I spray mine with cooking spray). Place 28 Oreos in a food processor and process until finely ground. Pour into a large bowl, add the melted butter, and stir with a flexible spatula until all crumbs are moistened. Place the cookie-crumb mixture in the lined pan and, using your fingers, press the mixture firmly and evenly into the bottom. Bake 10 minutes, then remove to a wire cooling rack (leave the oven on) while you make the filling. Snap the remaining Oreos in half, put them in the food processor, and turn on and off quickly a few times, just until the cookies are roughly chopped. In a large bowl, using an electric mixer on medium speed, beat the cream cheese and sugar until well blended, about 2 minutes. Scrape down the sides and bottom of the bowl with a flexible spatula and beat again until uniform. Beat in sour cream, vanilla and salt. Scrape down the bowl and mix again. Add the eggs, one at a time, beating well after each. After beating in the last egg, scrape down the sides and bottom of the bowl and beat one more time, to make sure the mixture is fully combined. Stir in chopped Oreos with the same spatula. To cut, use the foil overhang to lift the cheesecake out of the pan and place on a large cutting board. Use a sharp chef's knife to cut the cheesecake into bars, rinsing off the knife with hot water and wiping it dry between each cut. Keep refrigerated until ready to serve. 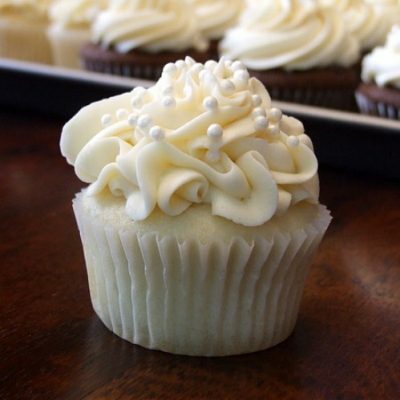 These work best served on flattened out cupcake papers w/ a fork stuck on top. These bars look so good! I love cookies and cream combo ? I’m not sure… longer, so keep an eye on it. Are you using the whole Oreos or just the cookie part for the recipe? Whole oreos should be fine! Made these for my husband’s work party – SO good and easy to make! They are a hit. I’ll def be keeping this recipe 🙂 Thanks! this will be my first attempt to make something that has Oreo as an ingredient. When it calls for the cookie, do I include the cream too?? I have all ingredients except for sour cream. Can it be done or can I sub with corn starch or milk? Thanks. An okay sub for sour cream is plain yogurt. I don’t think cornstarch or milk would work. I made this but the top is like.. slightly golden brown… is the trick to slice it off? looks nice though.. cooling it now. I have not eaten these warm, but I don’t see any reason why you couldn’t heat it up a bit! I adapted these slightly to make Pumpkin Oreo Cheesecake Bars! And they are soooo good! I’ve still got to try the original Cookies and Cream Bars though, I’ve had them bookmarked forever! 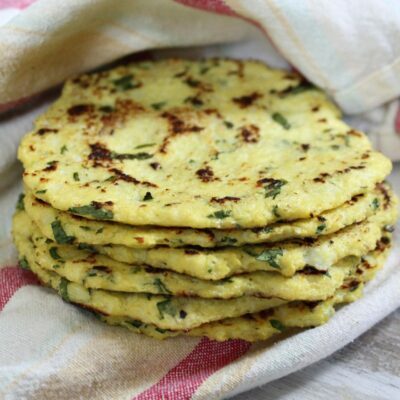 I made these and brought them into the office – they were a huge hit!! They are more like a real cheesecake than a bar though, so a bit messy to eat with your fingers, but sooooo good! I’m waiting for the ingredients to warm up to room temperature now- can’t wait to get started on these!